Network infrastructure and bandwidth are crucial factors when thinking about data protection and recovery tasks, such as VM backup, replication, backup copy, and recovery in VMware, Hyper-V, and AWS EC2 environments. The network is the “plumbing” that carries packets including VM backup and replication packets to and from business-critical systems. WAN links are often used to carry VM replication and/or backup copy traffic from one site to another, such as a DR site. However, WAN links are expensive and generally have low bandwidth when compared to high-bandwidth LAN connections. Even with faster and higher bandwidth networks that exist in enterprise datacenter environments today, WAN and LAN links need to be treated as a limited resource. Efficiency is extremely important when it comes to data protection, which includes network resources. Implementing technologies with our VM backup and replication jobs that can conserve network bandwidth, which allows us to make the most of bandwidth available for WAN and LAN networks. With NAKIVO Backup & Replication, we can utilize a technology called Network Acceleration to more efficiently send data between transporters, thus conserving bandwidth and impact on the production WAN and LAN networks. How does Network Acceleration work? How is it configured? Let’s find out. Network Acceleration is a technology which compresses and reduces traffic between a pair of Transporters. The Transporters within the NAKIVO Backup & Replication infrastructure perform the heavy lifting with VM backup, replication, and recovery jobs. They essentially move the data and perform all data protection and recovery tasks. By default, NAKIVO Backup & Replication installs one Transporter with a default repository. However, as mentioned above, a second transporter is required for Network Acceleration. The source Transporter can read the data, compress, and optimize it and then send the data to the target Transporter. Using Network Acceleration reduces the amount of data that is sent over the network. This has a direct impact on the overall network performance, bandwidth consumption, and production workloads. Additionally, this means that your VM backup, replication, and recovery jobs will complete faster. When thinking about VM backup, replication, and recovery jobs traversing the WAN connection, we would always want to utilize the Network Acceleration setting to move data as efficiently as possible over these comparatively slow and low bandwidth links. By using Network Acceleration, organizations can increase VM backup, replication, and recovery speed by up to 2X over WAN and LAN networks. Configuring Network Acceleration with NAKIVO Backup & Replication is incredibly easy to do. In the example below, we are configuring a simulated copy across the WAN connection to a DR facility with a backup copy job. The first thing to note is that we have two repositories added – one at our main site and another one at the DR facility. Additionally, both repositories use their own Transporters, so we meet the requirement for Network Acceleration of having more than one Transporter. 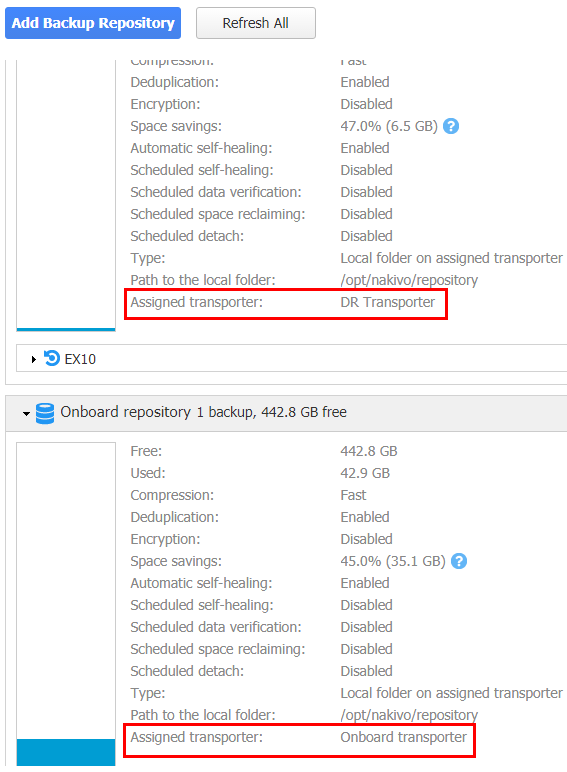 These can be configured in the Settings >> Transporters and the Settings >> Repositories areas of the NAKIVO Backup & Replication web interface. For the DR Repository, we have the DR Transporter servicing the repository. For our Production Repository, we have the Onboard Transporter servicing the repository. Let’s move on to the pertinent screens of the backup copy job configuration. The first thing we do is select our virtual machine backup job we want to be the source of the copy. Note that here we are selecting the DR Repo destination, which has the DR Transporter assigned. Skipping over to the Options tab, we see the Network acceleration option. We enable Network acceleration by setting the option to Enabled. Note that the description for Network acceleration mentions that compression and traffic reduction techniques will be used to save load on bandwidth. Additionally, the requirement for two transporters here is also mentioned. NAKIVO Backup & Replication provides powerful tools to not only effectively backup, replicate, and recover virtual machines, but also performs these tasks as efficiently as possible. By using the Network Acceleration feature, organizations can ensure that VM backup, replication, and recovery jobs do not affect production workloads and performance both in the local area network (LAN) and the wide area network (WAN). The network is a finite resource that must be managed with care along with any other resources in the environment, such as compute, memory, disk I/O, etc. Especially when thinking about backups, replication, backup copies, or recovery jobs traversing the comparatively slow and low bandwidth WAN connections, organizations can benefit from the compression and data reduction techniques afforded to them by NAKIVO Backup & Replication Network Acceleration. Network Acceleration is one of the many powerful features found in NAKIVO Backup & Replication that allows organizations to operate data protection effectively and efficiently.